And with three Six Nations titles in the last five years, and 23 victories in their last 26 matches, the New Zealander has earned that faith. It was only four months ago that Ireland disposed of the No 1 ranked team in the world to cap an extraordinary year. The truth, however, is that the manner of Ireland's capitulation yesterday, and the standard of their play in general during this tournament, do raise questions looking ahead. The accuracy, the confidence and the body language were a far cry from the team which took the Six Nations by storm last year. Ireland were battered by Wales yesterday. 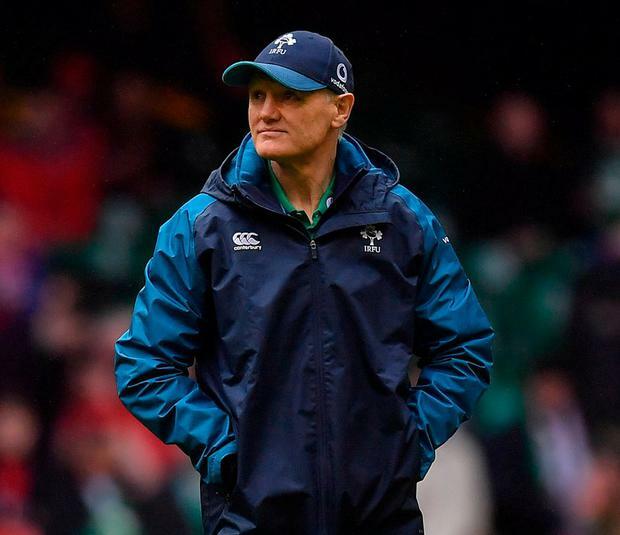 Never mind roof-gate - Schmidt started off his press conference by saying he did not think having the roof shut would have made any difference to the outcome, but ended it by conceding "maybe it was a mistake" - Ireland fans should be more concerned with the form of some of their most influential players. Conor Murray had a poor tournament. He is nowhere near being the player he was for the Lions two years ago. Johnny Sexton will probably never again have a day as poor as he had yesterday, losing control of the game in every sense as the error count mounted. But again, he has not looked the assured presence he was last year. "They haven't had a huge amount of game-time," Schmidt said of his half-backs adding that he was not worried by the visible frustration Sexton again showed. "He's been positive through the week and he's building his way forward." Perhaps. But there were others who performed well below par in this championship. Tadhg Furlong was the best tighthead in the world four months ago but he has struggled to recapture that form; Peter O'Mahony was anonymous yesterday making just two carries for two metres and just two tackles; while C J Stander's attempt to take a quick tap free-kick in the first half, only to shin the ball, summed up Ireland's day. "You guys will set the narrative," Schmidt replied when asked whether it could be described as a horror show. "We can only perform in those two 40-minute windows that we get and then the narrative will be whatever pundits or journalists put out there. "For us, we would encourage the genuine supporter not to lose faith in the team. The team will definitely turn up in Japan and we'll grow from this. You only have to look back a year and see that England went back-to-back in the championship and ended up fifth." One thing is incontrovertible: Ireland prioritised the World Cup at this Six Nations. In using 36 players - only Scotland used more with 37 - they blooded a number of young guns and tried a few different things. Some, the Robbie Henshaw experiment against England springs to mind, did not come off. Others, the emergence of Jack Carty, were more promising. "When we won our first championship in my time, six years ago, we used 17 starters," Schmidt noted. "We more than doubled that number who have played. So it's been a good exercise in trying to make sure that some guys have been put into pressure-cooker situations." Time will tell whether it pays off in the long run, but this was not a happy end to Schmidt's proud Six Nations career.